With more and more marriages making a style statement of sorts, the bridegroom wants to look his best just as the bride, who does her solah shringar. Suddenly, becoming a peacock has become essential for the would-be husband. While Mahatma Gandhi was working out his philosophy of life and advocating non-cooperation with the British Raj, there was one unusual follower who, in his efforts to experiment with the Mahatma’s creed, discreetly built a bridge between his theory and practice. 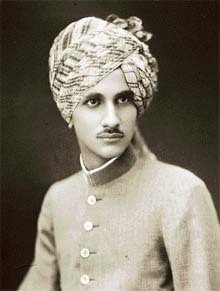 He was no commoner, but a prince - Raja Anand Chand of Bilaspur. His tiny state was situated at the foot of the Himalayas, now a district of Himachal Pradesh. Raja Anand Chand (1913-1983) charted out a 14-point programme based on Mahatma Gandhi’s beliefs. The Mahatma was always for complete prohibition; he believed that the drinking of alcohol tainted the human soul and tended to turn man into a beast. The Raja abhorred both drinking and smoking and never allowed these two to touch his life. In 1942, he introduced total prohibition in his state. To the Mahatma, khadi was a symbol of unity of Indians and their economic freedom. Raja Anand Chand made people aware of the importance of khadi. By 1940, all schoolchildren wore khadi clothes with the Gandhi cap as their school uniform. When a British Resident came to Bilaspur in 1942, he was astonished to see a whole population of Congressites! Likewise, sericulture was an important programme initiated by the Raja. Twentyfive per cent of the families started rearing silkworms as a profitable occupation. The Raja legislated against child and ill-matched marriages. Untouchability was practically banned and all landless untouchables were given a minimum of two bighas of land in order to raise their social status. Gandhiji’s Wardha Scheme of Basic Education was also launched. The scheme focused on the physical and intellectual growth of students while at the same time training them in useful local handicrafts. Adult literacy centres were opened in every Panchayat area and offered various mass education programmes. There were in 1939-40 about 1,200 unskilled workers like porters and rickshaw-pullers from Bilaspur working at Shimla. Twenty adult literacy centres were set up in Shimla by the Bilaspur state for these workers. Hindi was made compulsory in all schools and government offices. Gandhiji’s ideas on Panchayati Raj were followed. In 1938, Education and Health Committees (Panchayats) were elected in all parganas on the basis of adult franchise. A representative Constitutional Advisory Committee was formed. The Committee prepared a constitution on the most egalitarian principles. It provided for a decentralised state on the principle that local issues must be resolved locally. Libraries, reading rooms, clubs and dramatic societies were set up to infuse a sense of culture and artistic excellence in all the state’s citizens. The Raja himself directed about ten dramas. These included Raksha-Bandhan, Pratap-Pratigya and Shiva-Sadhna. The holocaust of the Partition soon overshadowed the euphoria generated by Independence. In Bilaspur, as many as 2000 Muslims had been living in peace. But their lives were in danger after stories of communal riots in the Punjab and elsewhere started reaching the state. The Raja decisively dealt with the situation and made 6,000 volunteers of the Home Front keep vigil in the villages of the state. A mobile cinema unit with a 16-mm projector was sent to tour all major parts of the state to show films and documentaries on patriotism and communal harmony. The people stood solidly under the leadership of the Raja, and perfect peace and tranquility prevailed. Not even one Muslim was killed or injured anywhere in the state. Rather, the display of unity became a great cementing factor at a time of considerable emotional stress and strain. 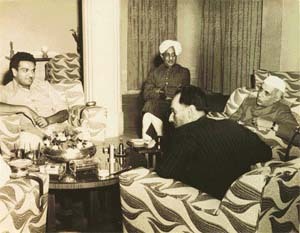 The Raja went to see Gandhiji at Birla House in Delhi sometime in October 1947. When they got to his usual darshan site on the lawn, they noticed that the large gathering, mostly made up of women, had started dispersing with expressions of discontent and some anger on their faces. They had not appreciated the advice of the Mahatma about providing protection to the Muslims who had decided to stay on in India as citizens of a free and secular country. Perhaps the wounds of these people coming from Pakistan were too fresh for them to accept such advice. The Raja sat at the feet of the Mahatma and conversed with him for about half an hour and narrated the steps he had taken in Bilaspur to preserve communal harmony. It was most satisfying for the Raja to see a ray of happiness on his mentor’s face. After Independence, Raja Anand Chand immersed himself in politics and involved himself most admirably with the poor and the downtrodden. His transformation and simplicity were marvellous to behold. He was elected unopposed to the First Lok Sabha. He was a Member of Parliament for 17 years and a Member of the Himachal Pradesh Legislative Assembly for five years. Do not wait till the marriage day for your haircut. Hairdressers have a strange way of making you look like a plucked chicken. So, go for a trim at least a week earlier, so that you can retrieve part of your lost “beauty”, if necessary. The use of face packs must be done weeks before the grand day. This is to ensure that possible allergy reactions do not come out on the day of your wedding. Your lips also have to look appealing. Use a good lip balm. De- toxify your body for the skin to look glowing. It may be difficult to avoid alcohol during the necessary bachelor parties but cut the intake as much as possible. Keep your facial shaving as late as possible during the wedding day. If you are going for a facial, manicure and pedicure (you may have to get the help of a qualified chiropodist too), get it done at least three days before the wedding. 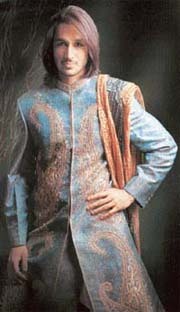 This change can be seen in the attire, accessories as well as the appearance of the bridegroom. Attire: Now all metros have one-stop shops for an ensemble for every ritual in a traditional Indian marriage. "We help the groom select outfits apt for ceremonies like the shagun, mehndi, pheras and the reception," says the owner of a specialist shop in Delhi. Accessories: These days not only does the bridegroom wear a kurta, churidar and dupatta that is almost as fancy and colourful as the bride’s but he has also started wearing elaborate jewellery. The new urban Indian male is not only clothes-conscious but also jewellery-conscious. Forget stuffy things like cufflinks, rings and gold chains. The most wanted male accessories now include earrings, armbands, even kadas and necklaces. As designer Sharbari Datta says, "Cufflinks are boring. The new groom is ready to experiment with any kind of jewellery, whether it’s a chunky necklace or an elaborate arm band. "The hottest-selling male accessories are extravagantly priced diamond kurta buttons and diamond necklaces. Designer Krishna Mehta helps her male clients accessorise her bandhgalas and sherwanis with beautiful pieces of jewellery, from ear studs to kadas. "I think the kind of jewellery men choose is still not very elaborate, but then the entire jewellery trend is minimalist, even for women." A fashion-conscious metrosexual male will go to any lengths to be "with it" – even if it means flaunting his less masculine side, says jewellery designer Poonam Soni. "Once, jewellery and trinkets were reserved for the rural male. These days, you’ll find more and more urban men wearing adornments and accessories that only women used to wear." Appearance: Today, grooms keen on presenting themselves as well-groomed men for whom besides shaving and haircut, manicure, pedicure and a facial are essential too.